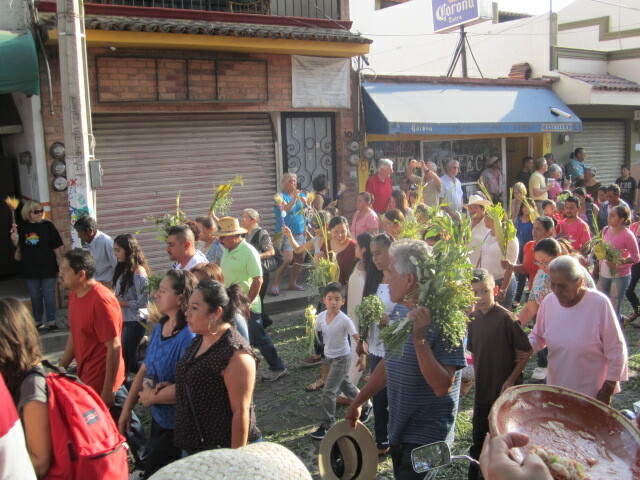 The Verbena Celebration was held at the Ajijic Plaza on April 9th, Sunday, the first day of Holy Week, Palm Sunday. Verbena has several meanings. It is a flowering plant that has 250 different species in it. It is a carnival. 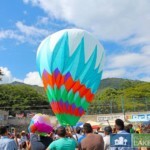 Also an agricultural show, amusement park and dance party. But I think dance party is the most appropriate meaning at this celebration. I didn’t stay for the dancing, which was after dark. 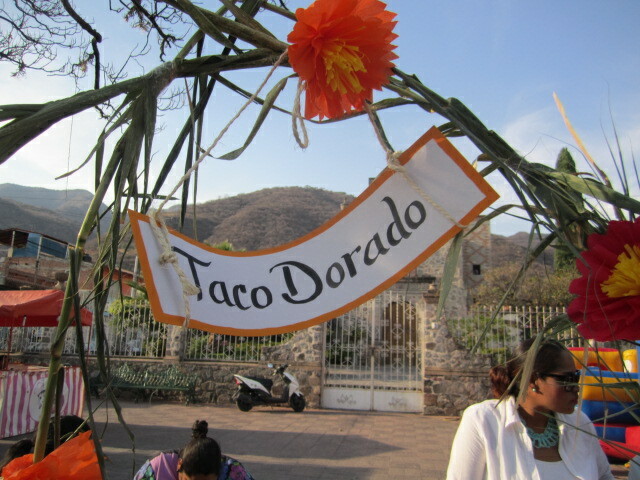 But I managed to try out the traditional Mexican foods and watch their donkey coming into town with two children riding on it. It was difficult for me to get photo of the parade because at that point the party had been going full swing for several hours. There were crowds of people waiting for the procession and I only got this one unclear photo of the main characters. 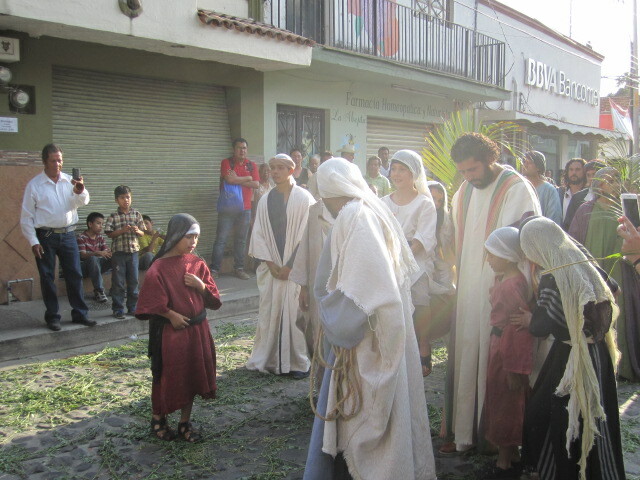 I was surprised to see how young Jesus was this year until I figured out that it was two children riding the donkey and possibly the man walking beside them with his head down was the official Jesus. That was kind of him to let the children ride the donkey. He is a big man and it was a long ride for that little donkey from six corners into the church. 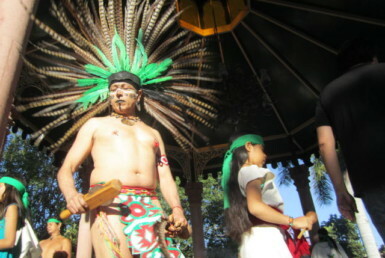 Above is a photo of just a small part of the procession. 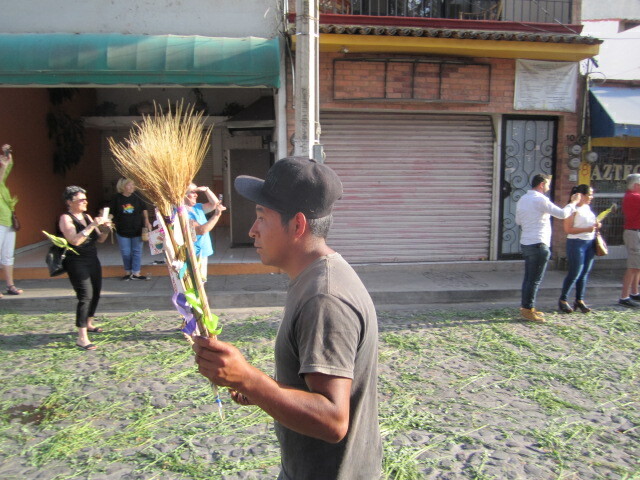 Notice the palm fronds many people are carrying. They are a tradition here. 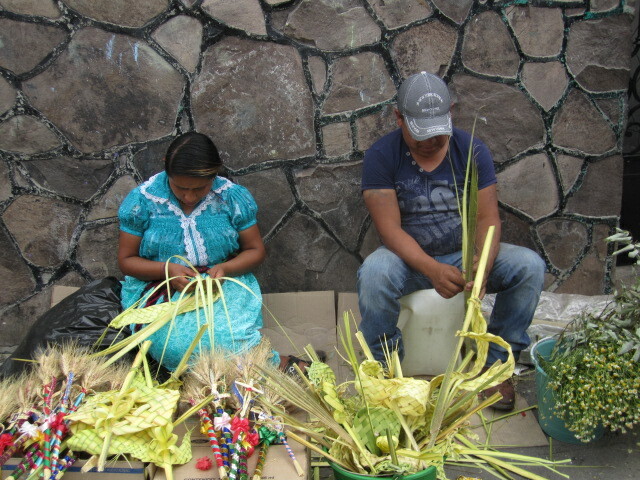 People from the local villages come in and work near the church to make beautiful sculptures out of the palm leaves. Also note the plate at the lower right corner of this photo. I will write about that in a few minutes. I wanted to get some close up photos of the work these people are doing. 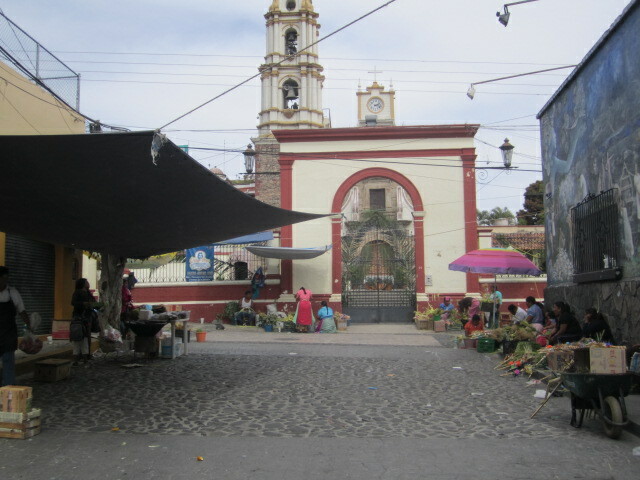 They were working all around and in front of the church. 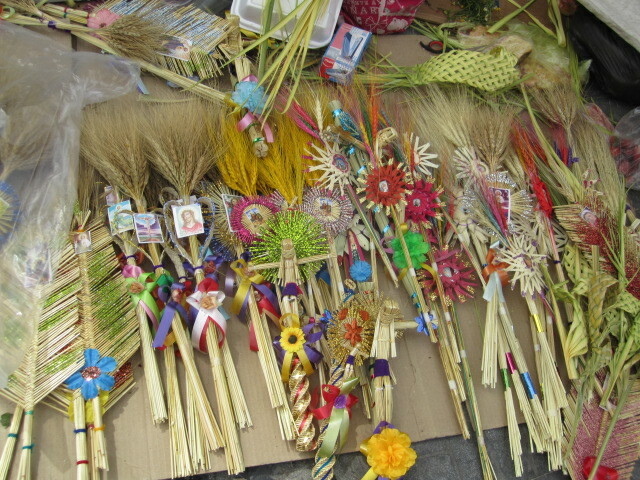 I was amazed at how intricate they were and they were sold for just a few pesos. Check out the beautiful sculptures these two people have made just by weaving the palm fronds together. Below is another photo of some more of them. All during the celebration people were walking around the area selling these hand held sculptures. The above photo was taken just as the procession was coming down the street. I wanted to get a photo of the cobblestones. They are strewn with alfalfa. In the past they used Palm fronds but they are too difficult to get. 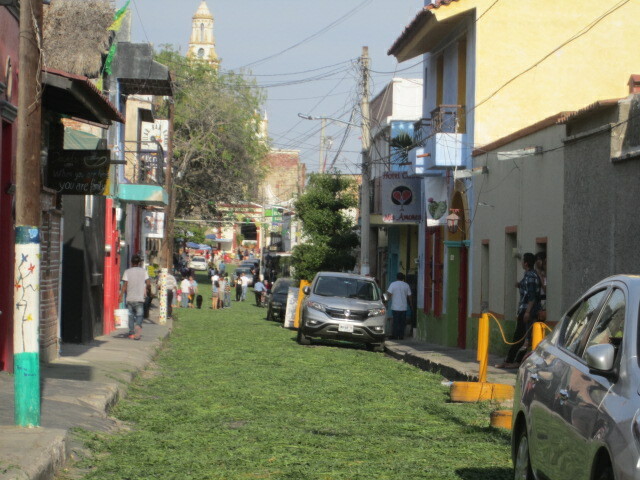 The street is filled with the alfalfa greenery for several blocks. People are told not to walk on them before the procession. It was pretty to see. Above is another photo of the street, all green, covered with alfalfa. 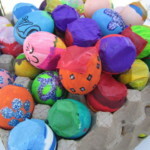 Part of this celebration is raising money for the next year’s Passion Play. 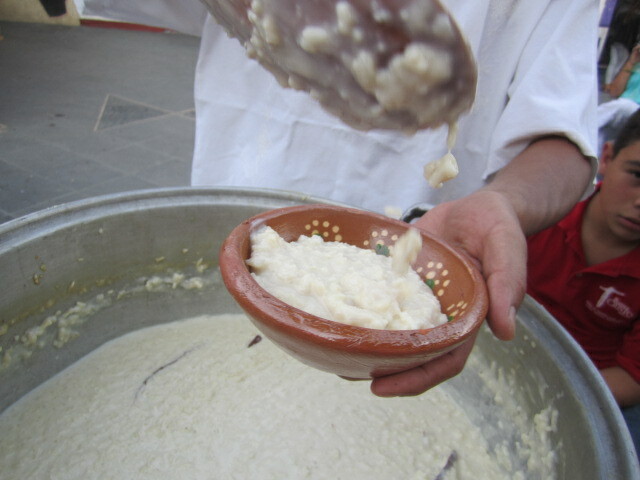 It is done by selling traditional Mexican food cooked only in the traditional way. There were many stands and all the food looked delicious. I bought a bowl of the rice for twenty pesos. I tried to give the bowl back to the man selling the rice but he said it was mine. All the food sold there was also served in the traditional pottery and when you bought the food, you also got the pottery. 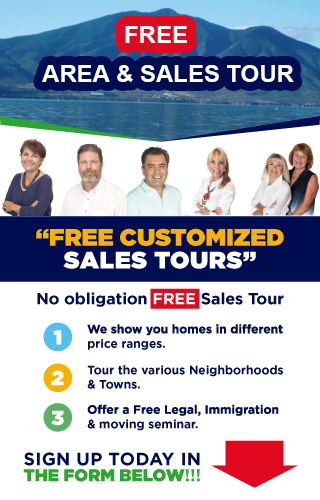 I don’t understand how they could make money with such low prices. You saw the plate already in second photo of this article. I didn’t count the number of food stands. 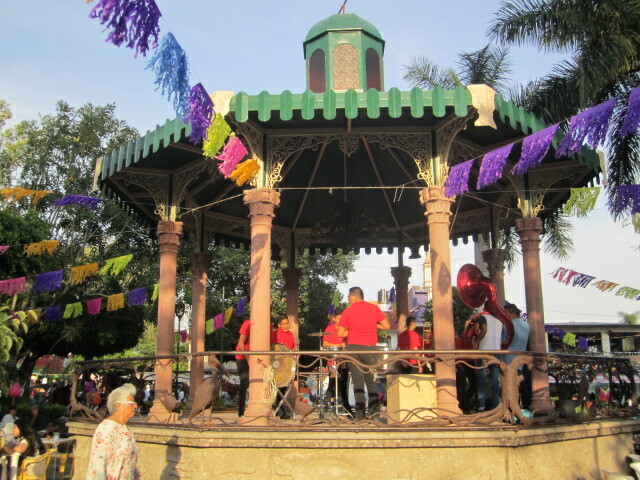 They circled the plaza. 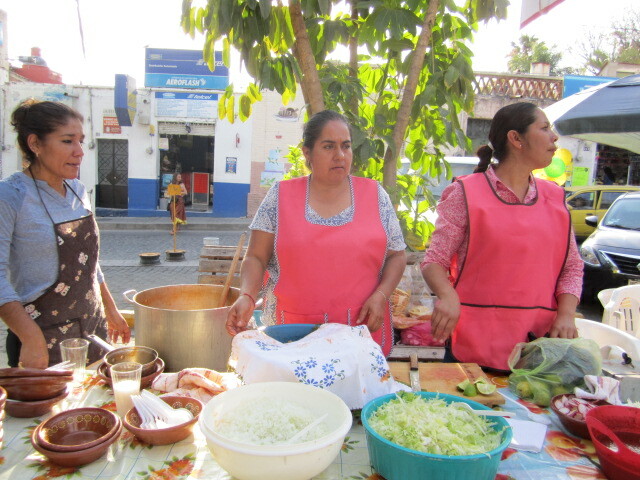 Below are some photos of them and the food they were selling. 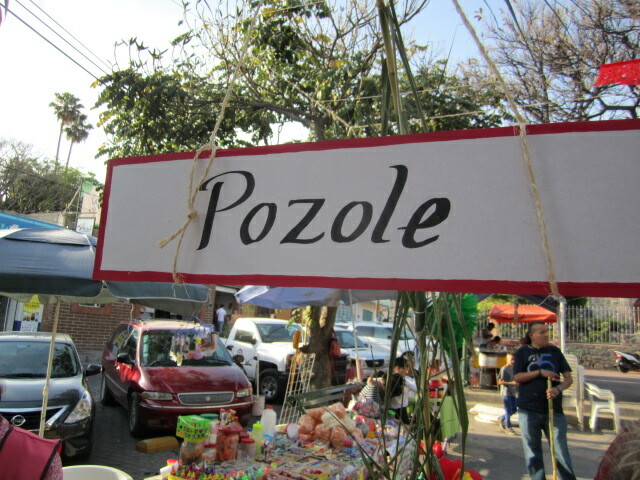 I wanted to get a photo of the pozole sign. 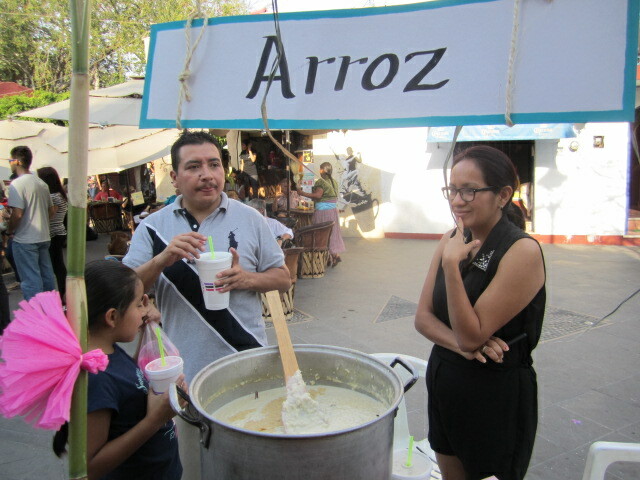 The stand in the photo above is not the Pozole stand. The stand is in the next two photos. Pozole is one of my favorite soups. 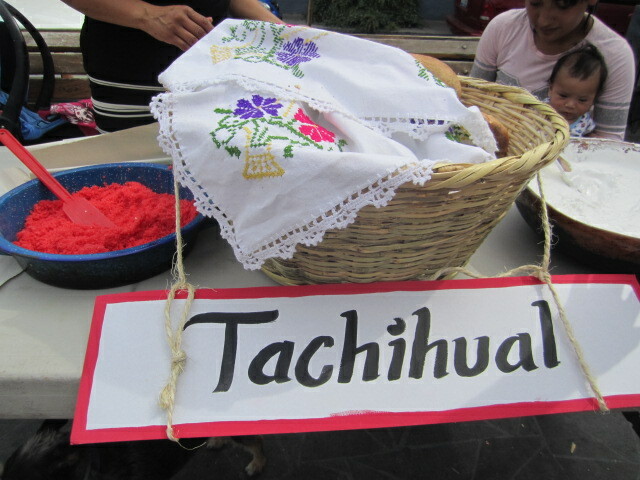 It is made with either chicken or pork, and hominy, with shredded lettuce, onions and lime on the top. The women in the above photo were waiting anxiously for customers but they came streaming in very soon. 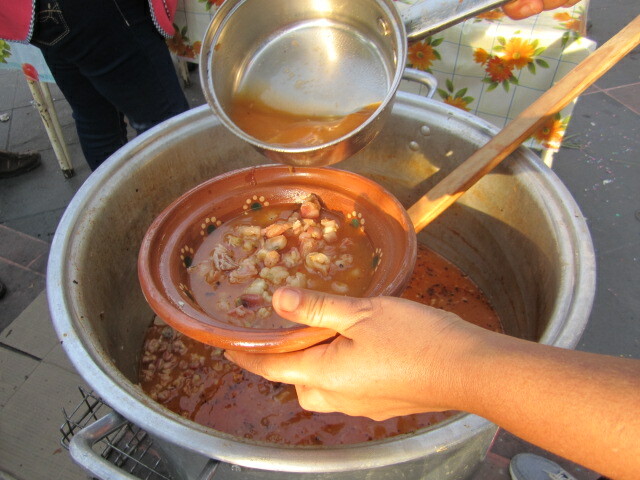 The photo above is the pozole before they add the garnish on top. 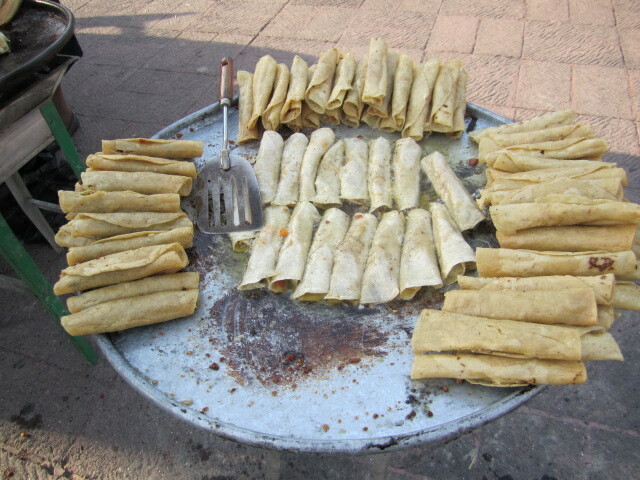 Tacos Dorado are rolled up and fried tacos, filled with chicken, beef or cheese. Remember that all this food is made with an open fire or coals, the way they were cooked for hundreds of years. 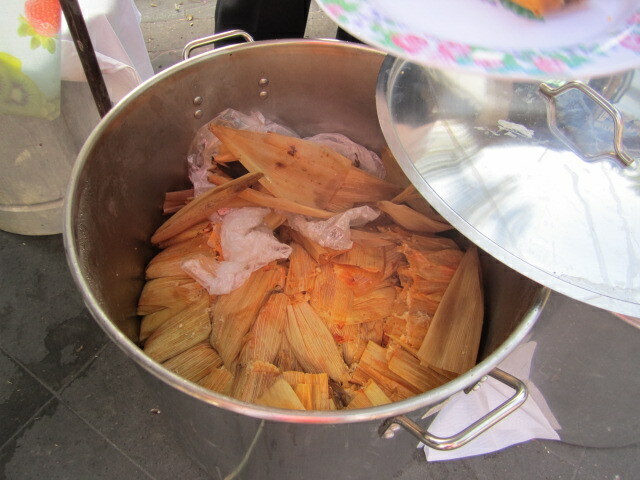 Tamales are corn husks filled with chicken, beef or cheese and steamed. 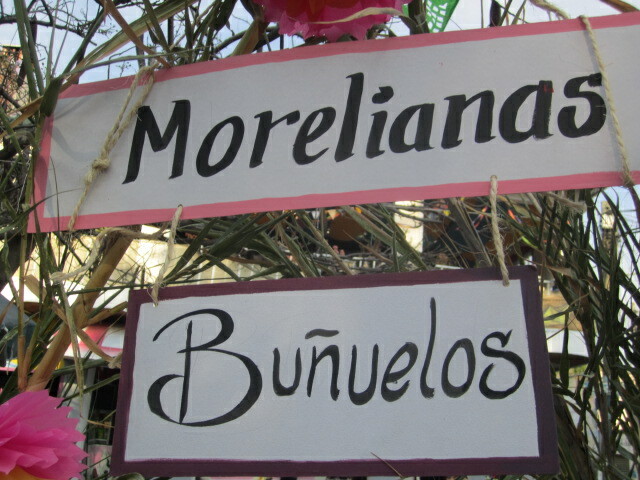 If you wanted something sweet for dessert, there were the Morelianas and Bunuelos. 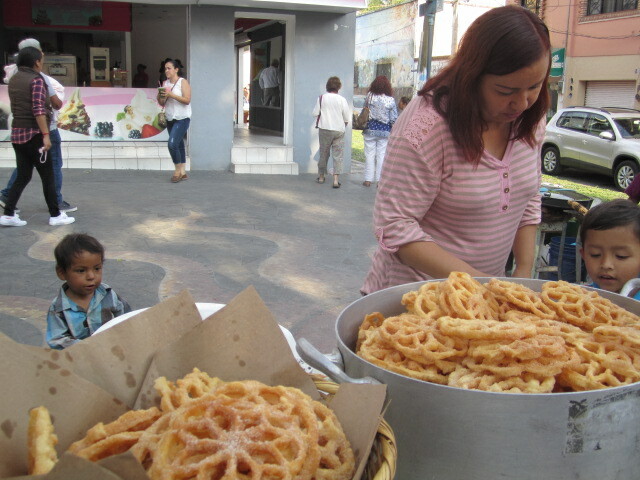 Bunuelos (in the photo above) are deep fried and made with flour, sugar and fat. What more would you want for a dessert? I loved seeing the two little boys watching their mother getting her stand ready. Maybe they were hoping for samples or leftovers. 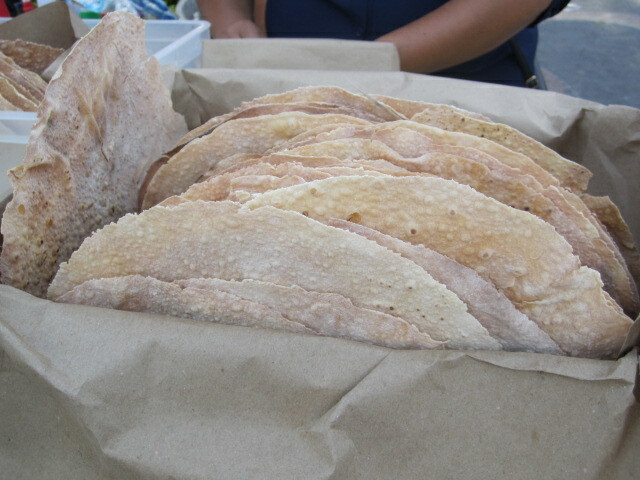 Morelianas look like large tacos but they are sweet and harder than tacos. They looked delicious but I could only eat so much food at the same time. I had to stop somewhere along the line. Maybe it was time for something to drink. 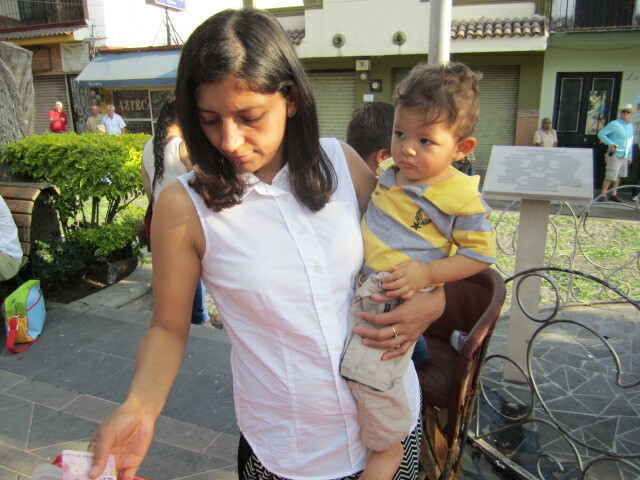 I enjoyed watching the families working together and the mothers taking care of their children while they made and served the food. 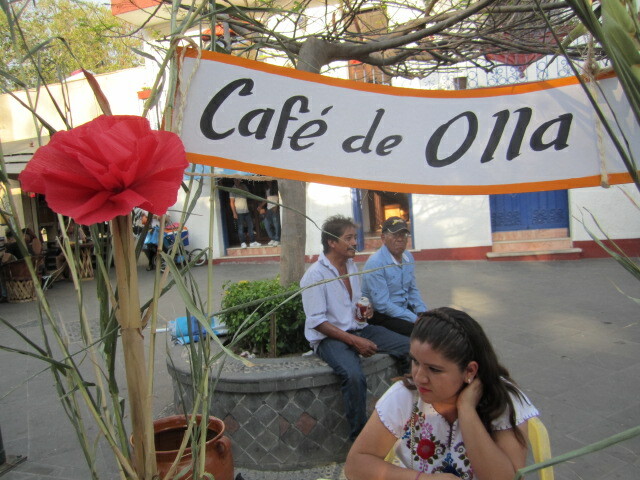 I bought a glass of Pulque Aquamiel Mezcal from her. 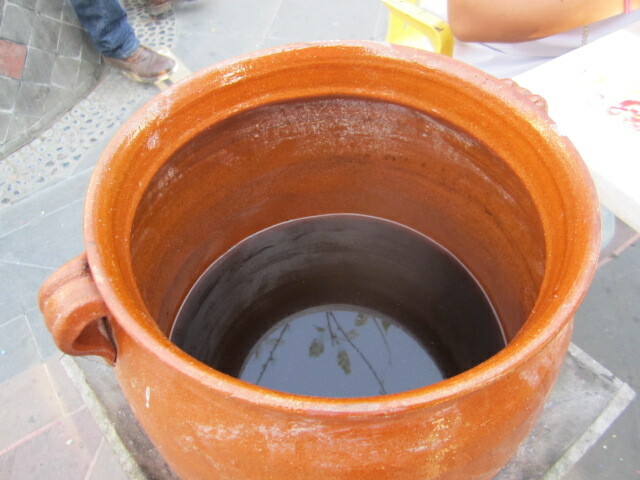 It is made from fermented sap of the maguey (agave) plant. And you know what else is made from the agave plant, tequila. So this is a slightly alcoholic drink. 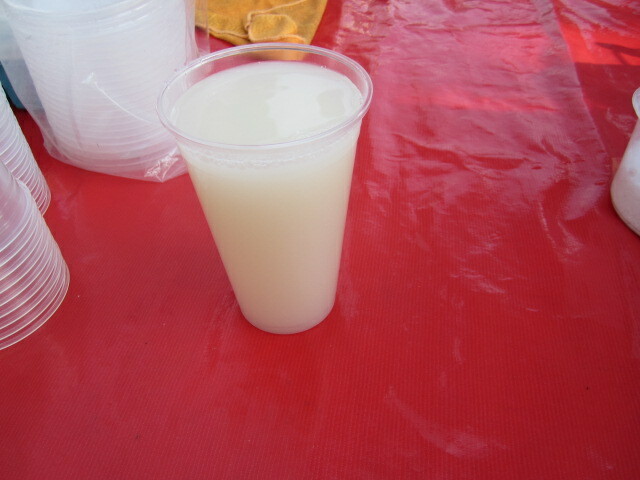 Above is a photo of my glass of Pulque. They used plastic glasses instead of the pottery cups but I am guessing that it tasted just as good in plastic as in pottery. The woman waiting for customers was looking very bored but her stand picked up later on in the evening too. Her coffee was also sold in the pottery cups that the customers kept. You cannot tell from the above photo but that is a very large pottery bowl, probably eighteen inches tall. She dipped a cup into that for individual coffees. How about a Tachihual? 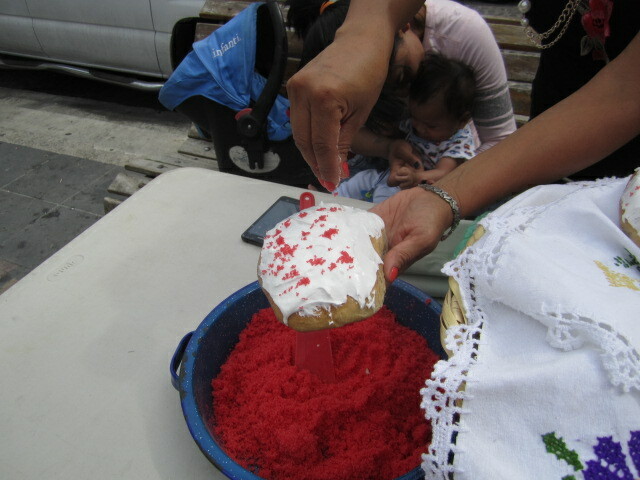 It is a sweet yeast bread that they add frosting and red sugar sprinkles to after you buy it. Goes great with the coffee. I liked seeing the beautiful handiwork on the towels that covered the bread. The bread looked so good that I bought two. Naturally I couldn’t eat that much so I gave one away. 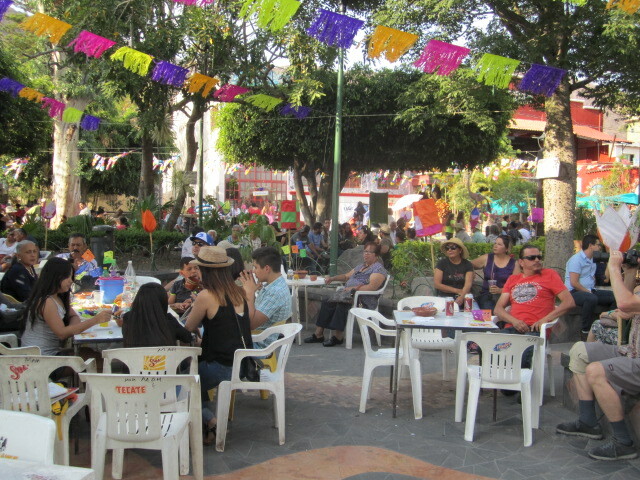 Below is a photo of the tables and chairs that were set out for people so they could eat their meals in comfort, while listening to the band playing. 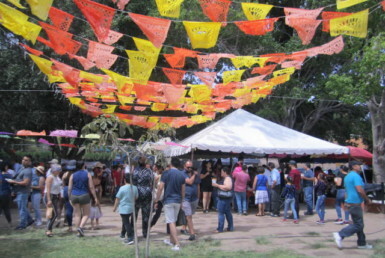 There were many other food stands but now I am going to focus on some of the activities. 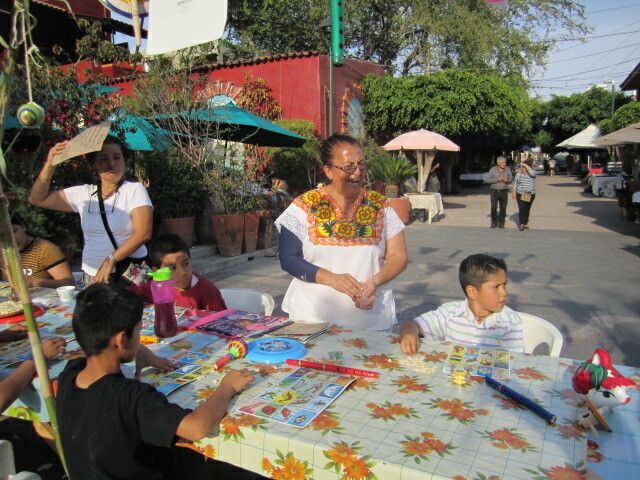 How about an exciting game of Mexican bingo? The Bingo table was a big hit with the children. Instead of their cards having numbers, they have photos that have to match up with what is drawn by the woman in charge. I am sure there was dancing later on in the evening. But I was tired and needed to walk home. The taxis were all busy and I knew I could walk home faster than waiting for a taxi. But I had a wonderful time. 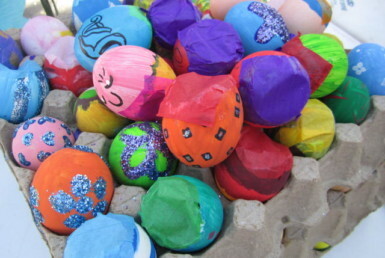 I hope if you are here during Easter week that you won’t miss this celebration. 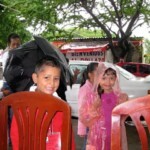 beautiful i have been there in the verbana and hope to be back i axixic soon. Thank you for the beautiful posting. 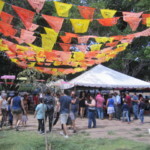 I love Mexico and all of the festivals that they enjoy. 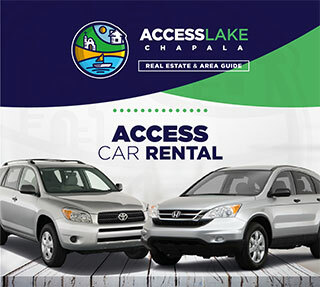 I hope to come to Ajijic soon and possibly retire there. 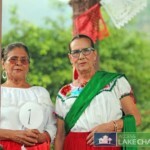 The Mexican people are simply THE BEST! Thank you for the beautiful pictures and narrative. It looks like a fun time.